The Song "Silver Bells" was Originally Called "Tinkle Bell"
Today I found out the Christmas song Silver Bells was originally called Tinkle Bells. To make matters slightly more humorous, Silver Bells originally appeared in the The Lemon Drop Kid, a 1951 film starring Bob Hope. Needless to say, these two things would have surely resulted in the song getting a few chuckles, had composer Jay Livingston’s wife, Lynne Gordon, not stepped in. They tried to get out of it for this reason, and also because there was some pressure due to their contract with the studio being about to expire. They felt they needed a hit and surely any new Christmas song would flop and perhaps their contract would not be renewed. As Paramount was insistent that the song they composed for the film had to be a Christmas song, they went ahead and began work on one. 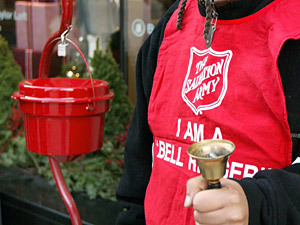 The bell on their desk provided the inspiration, as they then thought of the Salvation Army volunteers that would “tinkle” their bells outside of stores and on street corners, soliciting donations. Thus, a song was written about it and the “feeling of Christmas” these bell ringers contributed too. Silver Bells was first sung by Bob Hope and Marilyn Maxwell on The Lemon Drop Kid, and proved to be Livingston’s and Evan’s biggest hit, which is saying something, as for a time they were one of Hollywood’s top composer duos and often called “the last great songwriters in Hollywood”, writing such hits as the Academy Award winning Que Sera, Sera (Whatever Will Be, Will Be), the Academy Award winning Buttons on Bows, and the Academy Award winning Mona Lisa. Since its public debut in 1951, over 140 million recordings of Silver Bells have sold, performed by various artists. Even today, versions of it still chart, such as the 2009 version sung by Sir Terry Wogan and Aled Jones, which peaked at number 27 in the UK. The song Mona Lisa also originally started out with a different title, Prima Donna, but this time it was Evan’s wife who objected and thought Mona Lisa sounded much better in the song and the lyrics were changed accordingly. Neither Nat King Cole, who eventually recorded it outside of the film, and Capitol Records thought it would be a hit, so put it on the B-side of Cole’s record. In the end, though, it was a huge success, peaking at number 1 on the U.S. Billboard Hot 100, holding that spot for about eight weeks. Many later versions by other performers also performed extremely well.